Mohamadi, A., Yaghoubi, S. (2016). A new stochastic location-allocation emergency medical services healthcare system model during major disaster. Journal of Industrial and Systems Engineering, 9(special issue on location allocation and hub modeling), 85-99. Ahmad Mohamadi; Saeed Yaghoubi. "A new stochastic location-allocation emergency medical services healthcare system model during major disaster". Journal of Industrial and Systems Engineering, 9, special issue on location allocation and hub modeling, 2016, 85-99. Mohamadi, A., Yaghoubi, S. (2016). 'A new stochastic location-allocation emergency medical services healthcare system model during major disaster', Journal of Industrial and Systems Engineering, 9(special issue on location allocation and hub modeling), pp. 85-99. Mohamadi, A., Yaghoubi, S. A new stochastic location-allocation emergency medical services healthcare system model during major disaster. Journal of Industrial and Systems Engineering, 2016; 9(special issue on location allocation and hub modeling): 85-99. From the most important issues in the design of large logistics network in times of crisis are providing a timely quick reaction for treating of injured people and the rapid distribution of medicines and medical equipment. In this paper, a multi-objective model is presented that aims to determine the location of transfer points and hospitals to provide timely quick reaction for treating injured people as well as to determine unreliable and reliable depots for the distribution of medicines and medical equipment. Given that the dynamic nature of the great crises, the parameters of the model has considered as uncertain and dynamic. To solve the model, the hybrid meta-heuristic algorithm is proposed which is composed of simulated annealing algorithm and CPLEX. By comparing the results can be seen that the proposed meta-heuristic hybrid algorithm is efficient. Guha-Sapir, D. Hoyois Ph, Below R (2015). Annual Disaster Statistical Review 2014: The Numbers and Trends. Brussels: CRED. Berman, O., Drezner, Z., & Wesolowsky, G. O. (2005).The facility and transfer points’ location problem. International Transactions in Operational Research, 12(4), 387-402. Dessouky, M., Ordonez, F., Jia, H., & Shen, Z. (2006). Rapid distribution of medical supplies. In Patient Flow: Reducing Delay in Healthcare Delivery (pp. 309-338). Springer US. Berman, O., Drezner, Z., Wesolowsky, G.O., (2007) “The multiple location of transfer points,” Journal of the Operational Research Society, 59, 6, 805–811. Berman, O., Drezner, Z., Wesolowsky, G.O., (2007) “The transfer point location problem,” European Journal of Operational Research, 179, 978–989. Mahmudian, M., Keivani, A., Davoudpour, H and Ardestani Jaafari, A. (2010)"Two Iterative Algorithms for Transfer Point Location Problem" Journal of American Science, vol 9:pp.827-830. Hosseinijou, S.A., Bashiri, M., (2011) “Stochastic models for transfer point location problem,” The International Journal of Advanced Manufacturing Technology, 58, 1–4, 211–225. Kalantari, H., Yousefli, A., Ghazanfari, M. (2013) “Fuzzy transfer point location problem : a probabilistic unconstrained nonlinear programming approach,” The International Journal of Advanced Manufacturing Technology, 70, 1043–1051. Mohamadi, A., Yaghoubi, S., & Derikvand, H. (2015).A credibility-based chance-constrained transfer point location model for the relief logistics design (Case Study: earthquake disaster on region 1 of Tehran city).International Journal of Supply and Operations Management, 1(4), 466-488. Ebrahimi Zade, A., & Lotfi, M. M. (2015). Stochastic facility and transfer point covering problem with a soft capacity constraint. International Transactions in Operational Research. Kohneh, J. N., Teymoury, E., & Pishvaee, M. S. (2016). Blood products supply chain design considering disaster circumstances (Case study: earthquake disaster in Tehran). 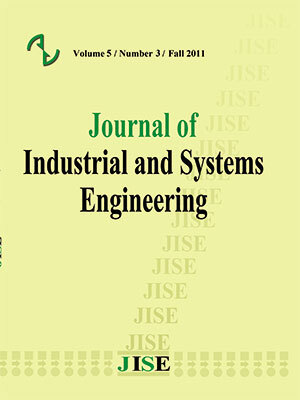 Journal of Industrial and Systems Engineering, 9, 51-72. Sasaki, M., Furuta, T. and Suzuki, A., (2008). "Exact optimal solutions of the minisum facility and transfer points location problems on a network," International Transactions in Operational Research, vol. 15, pp. 295-306. Jabal Ameli, S., Araste, K., Bozorgi Amiri, A (2012).The location of facilities and transfer points in the network. First international conference on nonlinear optimization. Araste, K., Jabal Ameli, S., Bozorgi Amiri, A .The location of the transfer point. MScs thesis, Iran University of Science and Technology. (2012). Cochrane, J. L., & Zeleny, M. (1973). Multiple criteria decision making. Univ of South Carolina Pr. Hwang, C. R. (1988). Simulated annealing: theory and applications. Acta Applicandae Mathematicae, 12(1), 108-111. Barzinpour, F., Saffarian, M., Makoui, A., & Teimoury, E. (2014). Metaheuristic Algorithm for Solving Biobjective Possibility Planning Model of Location-Allocation in Disaster Relief Logistics. Journal of Applied Mathematics, 2014.